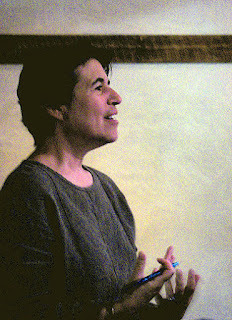 Natalie Goldberg (born in1948) is an American popular New Age author and speaker. She is best known for a series of books which explore writing as Zen practice. Goldberg has studied Zen Buddhism for more than thirty years and practiced with Dainin Katagiri Roshi for twelve years. Goldberg is a teacher who lives in Santa Fe, New Mexico. Her 1986 book Writing Down the Bones sold over a million copies and is considered an influential work on the craft of writing. Her 2013 book, The True Secret of Writing, is a follow-up to that work.